Anish Cherian recently completed his residency at the Skowhagen. Having come back with a bag full of memories and experiences, Anish shares with us stories of the ghosts he encountered during his nine weeks at the residency. The ghost of the middle aged woman had taken possession of the red farm - the oldest surviving farm in Skowhegan - which in the summer months accommodated a line up of artists, poets and writers. This was her spirit’s resting place despite weekly parties held in her presence for nine weeks. Skowhegan, I came to know gets buried under snow during winters, but she isn’t all that alone here, another ghost of a man much older than her allegedly has taken residence at the cabin Henry stayed at during this summer. For these two months when Henry’s doors opened to us - the resident artists - to fuelled barbecue parties and gave us time to slow down while listening to blues and jazz, and hiphop and rock and rap. The ghosts, now when I think about it, perhaps didn’t mind intrusions. After all the Skowhegan experiment is also about negotiating and pondering over these intrusions. The nine weeks at Skowhegan Residency is best understood as an experimental negotiation for over 80 artists - including 65 residents - to create a space for dialogue, through and for art. The presence of ghosts experienced in this space in all its manifestations was a part of this dialogue. My time here afforded me the luxury of a studio, something thats always gonna be missing in my artistic practice out of a rented apartment. At Skowhegan this studio extended everywhere, infringing on another’s artists practice and mutually developing a collaborative project. 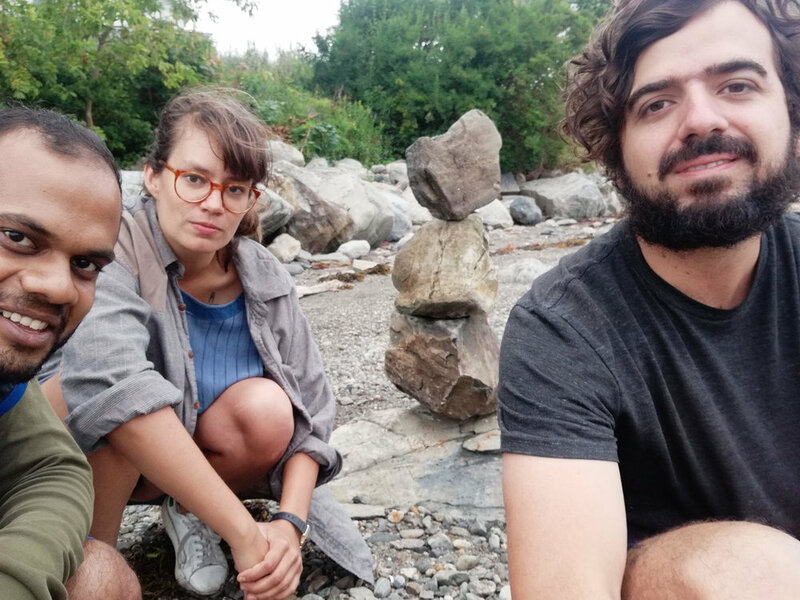 At Skowhegan, jumping into the lake, star gazing, rushing to eat your meals and sharing a smoke or drink brought strangers together to form a community. In my time with this community, I faced many ghosts, the ghost of my own practice, the ones that my friends brought along and the ones that knew Skowhegan’s many stories over the years. The ghosts of artists who were here before us, was always among us. The ghosts of past lectures were archived, the smallest marks on the studios led to another ghostly image of the past occupant lingering in the space. The Fresco barn adorned with passionate projects from the past, each telling a different tale of Skowhegan. Its 72 year history is an amazing adventure to venture into, and imagine my surprise when I found the names of John Cage, Kerry James Marshall and Chris Ware to the names of few of these ghosts that walked besides me. There were other kinds of ghosts too, ones that we brought along and perhaps learnt how to let go of them and rely on the ghosts of Skowhegan’s collective past. When 65 people come together deliberately and in consensus, expressing themselves in diverse artistic and other languages, it creates, enables and destroys illusions about ones own practice. The campus, spread across a mile with forests and marshes and lakes in the animated landscapes of Maine in retrospect is perhaps illusory. But my time at the residency, living a communal life was all too real, nonetheless its illusions have cajoled me. When am back in Delhi, I assume Skowhegan will seize to be real and its illusion fade away. But keeping in touch with the wonderful artists I met is real and it is current, the illusion has played its role in brining us together. The idea that all of us who were there at the campus together this summer, while today exist independently and individually outside of it, our collective ghosts will remain a part of its history, becoming a part of its future experimentations. Making Skowhegan all too real.